I am an absolute divil for candles so when I came home after a stressful day to find this gorgeous package of goodies waiting for me, it is safe to say I was over the moon. 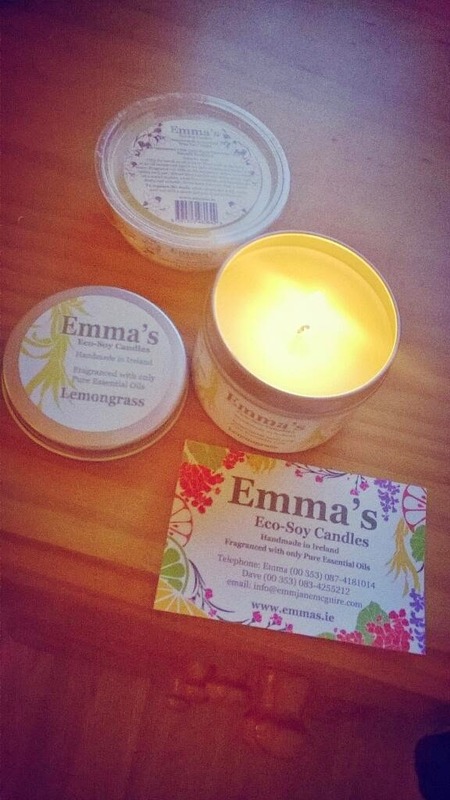 I had heard about Emma's eco-soy candles via Twitter and other bloggers such as All the buzz had featured them on their blogs previously so I was delighted to test them out. The beauty behind these candles is that they are all made of completely natural ingredients such as essential oils and soy wax, none of your typical synthetic nasties. This means that they won't cause an artificial overpowering smell and the headaches that can go along with too-sweet scents. I received a Neroli fusion wax melt which I have burning here beside me in my makeshift oil burner aka a little fondue pot. I adore this scent it is so calming and relaxing. "A blend of light and precious Neroli blossom and sweet orange oil with a touch of musky lavender: soothing, floral and calming." I couldn't believe it when I checked the website, the wax melt is retailing at only €4.95, what a fantastic price! There is also free shipping to Ireland. Score! Weekly at the Old Schoolhouse Market, Laurence Street, Drogheda - Saturdays from Feb 15th. Castletown House, Celbridge, Co. Kildare: Last Sunday of the month from Sunday March 31st to October, plus their Christmas market on Sunday 7th December. If you have heard of other Irish brands that are worth a try let me know!